Samsung QE85Q900R QLED 8K TV review | What Hi-Fi? 8K is here! Or, at least, the first commercially available 8K TV is, but that’s not really the same thing, is it? After all, 8K content is currently little more than a twinkle in Netflix’s eye. So why is Samsung pouncing now? Grabbing headlines certainly seems a big motivation, but the company also argues that the increased PPI (pixels-per-inch) combined with super-advanced, machine-based upscaling means the content you currently watch will look better on its 8K TVs. That’s an enticing proposition, especially when blown up to a huge 85in, which is the size of the Q900R we’re reviewing (it’s also available in 75in and 65in versions). At £14,999, it needs to be the best TV in the world right now, and in some ways it is. But in other ways it isn’t and, surprisingly, they’ve got little to do with resolution. Aside from its sheer size, there’s little in the styling of the Q900R that marks it out as a revolutionary new product. It's a smart-looking telly, but it doesn’t particularly distinguish itself from Samsung’s 4K QLEDs. Here, the thin bezels along the top and sides are angled outward rather than inward, as they are on the Q9FN, which means they reflect light differently and made the finish look darker, despite the material and colour being the same. The bottom bezel is actually thicker than that of the 4K QLEDs, creating a ‘lip’ of about 2-3cm. The logo, meanwhile, has been relocated to the bottom right, and it looks predictably tiny on a screen of this size. Rather than a central pedestal stand, the Q900R has two feet that can be located either end of the chassis or moved closer to the centre for placement of the TV on a smaller piece of furniture. If you’re brave enough to wall-mount the thing, the feet can be removed and stored in clever cutouts on the rear of the TV so they don’t get lost. And yes, the Q900R is compatible with Samsung’s own No Gap Wall Mount as well as standard (albeit very large and strong) VESA mounts. We reckon the QE85Q900R will look particularly spectacular with the No Gap Wall Mount, thanks to its entirely flat back panel. It gives the TV the look of a huge, framed painting. It can even pretend to be one with the built-in Ambient Mode. As is the norm for Samsung these days, the Q900R’s connections are located not on the back of the set, but on a separate One Connect Box. This box is huge, about two or three times bigger than that of the 2018 QLEDs, which was around twice the size of the one before. But, while it’s massive compared to previous incarnations, the new Q900R’s One Connect Box is still significantly more compact than, say, a premium Blu-ray player or PlayStation 4, and because it doesn’t need line-of-sight or have a display that needs reading, it can be hidden away. It ran fairly hot during testing, though, so it may be best to make sure it’s got some ventilation. The cable connecting the One Connect Box to the display has also increased in girth thanks to the added power and data transmission requirements of the 8K display. It’s still much thinner than the average HDMI cable and its semi-transparent design makes it easy to ignore. While the One Connect Box has grown much bigger, its connections are similar to those of the 4K QLEDs – the one difference is that the first of the four HDMI inputs can handle 8K video signals at up to 30fps. One day, perhaps, there’ll be a source that can take advantage of that. None of the HDMIs are 2.1 certified, which is because official certification is not yet underway. Samsung says buyers of the Q900R will be able to request a free upgrade to an HDMI 2.1-compliant One Connect Box next year, which should give some reassurance to those early adopters considering forking out £15k on a new TV. But that upgrade may not even be necessary, because many HDMI 2.1 features are already supported, including Variable Refresh Rate (VRR) and Auto Game Mode for gaming, and dynamic metadata for HDR10+. The update will really only bring with it an upgrade of the HDMI 1 port to 8K at 60fps, rather than the current 30fps cap. Other connections are unchanged, so you get three USBs, ethernet, optical, aerial and two satellite connections. There’s no aerial socket, so if you want to connect headphones you’ll need to use Bluetooth. The operating system is also unchanged from the rest of the current QLED range, and while that means there’s less software-based fanfare than you might expect from a new model, it does mean the Q900R is predictably slick in use and absolutely jam-packed with apps. From Netflix and Amazon Video in 4K and HDR, to Rakuten and Google Play Movies & TV for pay-as-you-go blockbusters, plus the full suite of catch-up apps and even Now TV, pretty much every base is covered. The OS is also bright, welcoming, customisable and snappy, making accessing content super-quick and intuitive. In terms of sheer display tech, you don’t only get the 8K resolution of 7680 x 4320, you also get a record-high peak brightness figure of 4000nits from the 85in and 75in versions of the Q900R (the 65in version taps out at 3000nits). For reference, the Q9FN, the previous brightest TV we’d tested, is rated at 2000nits. But what’s the point of 8K TV? After all, isn’t 4K sharp enough? Samsung makes a fairly compelling case on this front, pointing towards a global trend for TV upsizing. It’s all about pixel density, is the argument, much as it has been with phones. For example, the iPhone XS Max’s screen is 12 per cent bigger than that of the iPhone XS, and it has 12 per cent more pixels. This means both phones have the same pixel density and are therefore equally sharp. An 85in 8K set such as this has the same pixel density (104ppi) as a 43in 4K model. That’s a fairly compelling case for the increase in resolution, assuming we will all buy bigger screens in the future. So how does native 8K content look on the Q900R? Utterly fabulous, as you might imagine. Predictably, it’s all about sharpness and detail. The image is unbelievably lifelike, and draws you in to an extent that 4K simply can’t match. Naturally, it’s helped by the sheer scale of the 85in display – this is cinematic and then some. And the image doesn’t become soft or fuzzy as you get closer. You could sit a foot away from the screen and still be blown away by the perfect sharpness. But with no ‘proper’ 8K content currently available, this part of our review is entirely based on native 8K footage supplied from Samsung. It’s a typical selection of tight, colourful patterns and beautiful, drone-shot scenery designed to play to the TV’s strengths not only in terms of resolution, but also brightness, dynamism and colour vibrancy. It’s an amazing, immersive glimpse at what 8K may offer. But for the foreseeable future, you’re going to be watching video of a much lower native resolution than 8K, and that’s where Samsung’s AI-based upscaler comes in. This upscaler uses machine learning to analyse millions of images in both low and high resolution, comparing the two versions of the same object to identify the differences so they can be added on the fly when a low-resolution signal is fed into the TV. The result, Samsung says, is increased detail, sharper edges, reduced noise and fewer jagged edges. Essentially, non-8K content should actually look better on a Q900R than it does on a non-8K set. The processing power and data transfer speeds needed to make such judgements and adjustments are pretty huge, so can’t be done in real-time via the cloud. Instead, all of the learning is done by Samsung’s servers and ‘taught’ to the TVs in people’s homes during regular software updates. That means a Q900R that you buy now should only get better at upscaling in the months to come. The upscaling is very good indeed. Miraculous when you consider how much of on-screen picture is being ‘made up’ by the TV. But whether it provides a better upscaled image than a 4K set is a trickier question. One of the problems is a paucity of reference TVs at this size. Samsung was kind enough to supply an 82in NU8000 (the UE82NU8000) and 75in Q9FN (the QE75Q9FN) as comparisons, but they’re both relatively unknown quantities to us. Samsung’s insistence that we use the NU8000 as a reference for resolution and not the Q9FN rang hollow, too. The NU8000 is far lower down Samsung’s range than the Q9FN, so there’s much more at play, picture quality-wise, than just resolution. Yes, the Q900R beats the NU8000 in just about every aspect, including sharpness and detail, but as far as we’re concerned that proves very little. Besides, using Samsung’s own pixel density argument, this 85in Q900R should be capable of sharper images than even a smaller, 75in Q9FN, because it has 104ppi to the 4K set’s 59ppi. To us, that makes it a perfectly valid comparison on all fronts. To get to the point, the Q900R performs well compared to the Q9FN across all content, but it’s not a significant step forward, and in some areas, it’s a step back. We start with 4K, and our current test favourite Guardians Of The Galaxy Vol.2. While the Q900R is noticeably brighter than the Q9FN, it is not overly so. The sunset over 1980s Missouri has more impact, as do the reflections from the metal plates on the Sovereign planet, but it’s a brilliantly judged, incremental improvement rather than an overly dazzling trick. Colours are even better on the Q900R. The Q9FN is gloriously rich and vibrant, but not what you’d call neutral. The QE85Q900R can look a little pale next to the lushness of the Q9FN, but there’s no doubt that it’s more authentic, and that gives it a better balance across multiple sources and content types. But don’t think the Q900R isn’t vibrant in its own right. There’s real punch to the vivid colours of Ego’s home world, ostentatious lustre to the Sovereign queen’s throne room, and lusciousness to the dense green foliage on the planet of Berhert. This is a very sharp and detailed picture. Not only is this 8K TV upscaling the image without softening it, it’s doing so without introducing anything in the way of obvious artefacts, shimmer or noise. But it's not sharper and more detailed than the Q9FN, it’s simply as sharp. But the Q9FN is a supremely sharp and detailed picture in its own right, so what you get from both TVs is an image that pops from the screen with crispness and definition and delivers the finest details that the disc has to offer. It looks incredible. The fact that the 85in Q900R matches the 75in Q9FN for sharpness bodes well for the 75in and 65in versions of the Q900R. Logically, these should be a step-up over the equivalently sized Q9FNs, so it’s in some ways a little disappointing that Samsung chose the 85in as the first review model, despite the sheer wow factor it supplies. It is worth pointing out that there are some specific images or objects that prove a challenge too far for the upscaler. In the opening scene of Guardians Of The Galaxy Vol.2, when Ego looks at Meredith in the car, the tilt of his head means the ‘crossbar’ of his sunglasses is at a tricky, diagonal angle, and despite Samsung’s claims about jaggy-eradication, there are clear steps along this line that aren’t evident on either the Q9FN or the NU8000. Perhaps this image could be fed into Samsung's server? While that’s a minor flaw, there are a couple of bigger ones too. The Q900R doesn’t produce blacks as deep as those of the Q9FN. Samsung says that’s intentional: the black level has been raised slightly in response to suggestions from some that the Q9FN loses some dark detail to its depth. It’s a decision we can't really get behind. What’s more, the Q900R suffers from noticeable backlight bloom that the Q9FN doesn't. This is most noticeable in the black bars to the top and bottom of a widescreen film, but it can creep into the main image, too. Straight on to the set in normal viewing it’s not noticeable, but sit a little off-axis and it becomes much more pronounced (viewing angles are, in fact, generally worse than those of the Q9FN). The fact that it’s there at all when it’s not on the Q9FN is disappointing. Perhaps it’s related to the doubling of the brightness, or perhaps it’s more to do with Samsung not adding more dimming zones to the 500ish of the smaller Q9FN sets, but it’s something that just shouldn’t be there as far as we’re concerned. As you drop down a resolution, the Q900R remains consistent, and considering the amount of upscaling going on, that in itself is exceptionally impressive. Play Logan on 1080p Blu-ray and the image is supremely clean and stable, and again very similar to the Q9FN in terms of sharpness. Colours are actually more vibrant on the Q900R, but in a way that simply proves their authenticity. It’s subtle, but there’s a little more blue in the sky, a little more copper dust on Logan’s shirt and a little more lushness to the leaves of a tree. It’s a really well judged palette. But contrast again is an issue. As Logan enters his hideaway you get better brightness from the Q900R as the sunlight pours in, but the dark parts are hazy. The rug hanging from a line is grey and murky on the Q900R, where it’s darker and more pronounced on the Q9FN. Dark detail is a little better, but blacks aren’t deep enough. Finally, looking to stretch the Q900R surely further than it can possibly handle, we play Dirty Harry on DVD. Here, the TV is generating something like 98 per cent of what you’re seeing. It’s insane, particularly as the image is really good. It wasn’t long ago that standard-def was more or less unwatchable on a 4K TV, so the cleanliness, sharpness and detail on the Q900R is little short of miraculous. It’s as good as the Q9FN in those regards, and brighter and punchier, too. The relative sacrifices to black depth remain an issue, but this is an undeniably impressive feat. It is worth mentioning, though, that while the Q900R is an excellent handler of motion in 8K (so far as we can tell from the demo footage) and strong with 4K (albeit beatable by a premium Sony), it does struggle a little more with 1080p and standard-def content, presumably as it's having to generate lots of extra pixels as part of the upscaling process. On the subject of speed, the Q900R gave us an impact lag measurement of 16.7ms with Game Mode selected and all other processing features turned off, and 37.6 with Samsung’s smoothing Game Motion mode switched on. Should you be considering spending £15k on an 85in TV for gaming, you’ll be pleased to hear that the Q900R will have no problem keeping up. With all of the excitement surrounding its picture quality, the sound performance of the Q900R might be a secondary consideration. However, it would be somewhat odd to consider spending £15,000 and not combining it with a serious, dedicated sound system. But for anyone who might expect great sound quality at this price, the Q900R is actually very similar to the Q9FN. That means it’s big, bold, clear and spacious by the standards of most TVs, and perfectly listenable. It’s not, though, anything special as far as sound is concerned. Someone had to go first with 8K, and it’s not a huge surprise that Samsung has taken the plunge, partly on account of its record of innovation, and partly because it’s always on the hunt for new ammunition in the war against OLED. But the lack of native content poses a problem when it comes to evaluating an 8K TV. The demo footage proves that native 8K can be utterly mesmerising, but with ‘proper’ content still years away, that’s irrelevant when deciding whether the Q900R is worth purchasing. 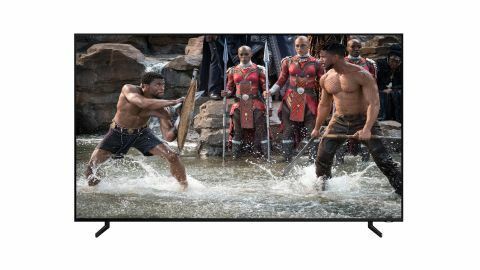 An 8K TV has to live or die by its performance with the 4K, HD and SD content that’s available right now. Luckily, the Q900R delivers a largely excellent performance with this content, particularly when you consider the amount of upscaling going on. We wouldn’t be at all surprised if Samsung’s upscaling proves to be the benchmark. But what the Q900R doesn’t offer is a clear step up in the quality of this content when compared with the company’s flagship 4K model, the Q9FN. At least, not at this size. The scale offered by the 85in 8K display is astonishing, but we can’t help but think it isn't the sweet spot in the Q900R range. Drop down to the 75in version and the PPI goes up from 104ppi to 117ppi, and that could well be enough to squeeze out an even sharper image than a Q9FN at the same size. What’s more, the 75in Q900R costs less than half of the 85in version. Meanwhile, the 65in model takes the price down to £5000 and the pixel density up to 136ppi. That could well be a serious step up from the QE65Q9FN, and that would make it the best TV you can currently buy.